We hear it over and over, why aren't there more pedicabs in Philadelphia? Well it's not like entrepreneurs haven't tried. The problem is whenever a business tries to set up, someone in the city's bureaucracy tries to shut them down. Denied access to the best revenue location in the city, Philadelphia Pedicabs eventually folded. Next came Chariots of Philly. They have been operating quietly and successfully in Manayunk for the past few years. The minute they tried to operate a convenient transportation option in the congested Stadium Area for Eagle's games, L&I ordered them to cease operations and impounded one of their bike trailers. A hearing is scheduled in May to uphold the cease operations order. Chariots of Philly have, for now, settled on expanding service in the friendlier confines of Avalon NJ. AN ORDINANCE Amending Title 12 of The Philadelphia Code, entitled "Traffic Code," by adding certain definitions and by amending Section 12-800, entitled "Bicycle Regulations and Penalties," prohibiting pedalcycles that seat more than two passengers from roadways, all under certain terms and conditions. 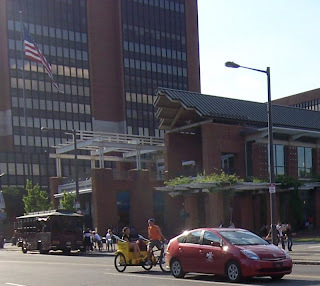 The Bicycle Coalition contacted the bills sponsor, Councilman DiCicco. As a result a hearing on the bill was canceled and no further action was taken. It is time for Philadelphia to allow all modes of transportation, be it by foot, by pedal power, or by carbon fuels. It is time for Philadelphia to encourage all entrepreneurs, for that too helps all Philadelphians and its visitors. It is particularly time for Philadelphia to encourage and celebrate "green" initiatives like Pedicabs. We hope the city will quickly do what it needs to, and allow all of us to see and use Pedicabs this spring. Hmmm what happened to the Eagles GoGreen Campaign? Is transportation not part of the program? I agree it is time! We hope things will turn around this year. Small correction - Chariots of Philly was the first pedicab service in Philadelphia and Philadelphia Pedicab Company was the second- we began serving Manayunk in October 2003 and got our business license in April 2004. We operated downtown for holidays and special events (4th of July and other events in 2004, Live 8 in July 2005, etc. ), but never had problems until we rode down at the stadiums in 2006. We are confident that this will only benefit the city, and need your support for Philly to allow our service- please contact Curtis Jones Jr and City Council President Anna Verna to let them know you want pedicabs in Philly! (go to www.phila.gov and click on City Council for their contact info). Is anyone out there from Manayunk? I basically already gave it up but about a year ago i had a pedicab stolen from me in West Philadelphia and heard awhile back that it had been spotted in Manayunk. The cab was blue, pretty beat up, had a broken throttle, batteries underneath the cab. It had a new threadless headset that i had installed and the frame was a khs, although it was painted over (black). It had a black, fold-up canopy with a rain cover and bmx style handlebars. Other than this, the only distinguishing feature was (at the time it was stolen) it had a couple of long bungee cords wrapped around the cab that i used to use to secure my backpack. I pretty much already gave up on finding it (it was a year ago, in June that it was stolen) but recently a few people who had seen me riding it in my neighborhood asked me about it and I figured I'd give it another shot. For awhile, i was thinking about going into business but then realizing the difficulty of the logistics (paying for a garage which costs more than my rent, paying taxes, getting pulled over by cops etc.) I decided to just use it for fun, giving kids in the neighborhood free rides and maybe taking out friends who were going on a date. Part of the main reason i gave up looking for it was that i didn't want to involve police and get someone arrested, whether they unknowingly bought it or actually stole it and i'm not really into the vigilantism involved in going to Manayunk to track it down and "re-steal" it. Just thought i'd make a last ditch effort to find it, and if somebody knows where it is or might have bought it, i'd be glad to offer some money to get it back.